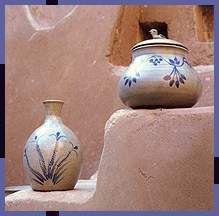 Prior to its introduction at Harrania, Ramses Wissa Wassef had already had considerable experience with stoneware ceramics. As a lifetime hobby and love, he had spent many years experimenting with the craft. At home he had built a potter's wheel and a solar kiln to fire the ware. In fact, he had built 28 prototype kilns before ultimately devising one that satisfied him. Based on Ramses' original design, this type of kiln is still used at the center today. His extensive experiments with clay mixes and glazes also enabled him to develop a type that could withstand very high temperatures. Ramses built a small workshop at the center expressly for ceramics. In the following passage, he describes his method of teaching using clay as the medium. "I had made a number of experiments with ceramics and developed a paraffin kiln which made it possible to reach high temperatures very economically. I proceeded in the same way as for weaving; I fixed up potter's wheels, bought clay, and showed the children what to do. I then left them to work on their own, modeling figurines and turning pots." observed that the young potters had acquired great skill and that they could glaze and fire their own work. These achievements, however, were to be just the first phase in the potters' development. Suzanne Wissa Wassef, Ramses older daughter, was to take a personal interest in pottery. For a long time Suzanne had watched her father and had acquired a genuine love for the craft. This lively interest in ceramics would continue well after her father's death. Here she describes her role with the potters. "Since this craft was not an integral part of the village tradition, the children's forms lacked a practical aspect. My role was to direct their creative talent in producing more functional objects, as well as to allow the malleability of the material at hand to dictate its own optimum forms." In this way Suzanne was able to give new direction to these children who had learned the technique but lacked the necessary sense of design. An important aspect of her work is the use of the single-fire technique. Also used by her father, it creates a more natural end product. 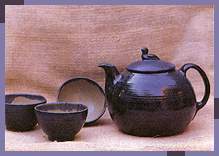 Suzanne's main challenge with pottery was to rediscover her father's knowledge of firing kilns. The kiln used for the single-fire method is sensitive to temperature variations. Here, no barometer is used and temperatures are judged merely by the colour of the flame. "This is a very exciting process," concludes Suzanne, "because of the element of surprise involved each time the kiln is opened." Today, it is she who designs, glazes and fires all of the stoneware produced at the center.